Did you know the study of Math involves primarily arriving at a solution step by step? This critical skill is essential in every walk of life. And our world class math tutors know that this is exactly what every student needs. Our tutoring is individual-oriented and therefore personalized to suit each student according to their skills and needs. The live online tutoring hour adopts a logical, step by step way of teaching. The best thing you can do for your child is to give them the eTutorWorld advantage and help them to not only master these valuable skills but also have the confidence required to succeed in grade school and beyond. A percentage is a number or ratio expressed as a fraction of 100. It is often denoted using the percent sign, “%” .We use the percent symbol (%) to express percent. How do you get percentage of a number? How do you get a percentage of an amount? A percent is 1 part out of 100. 1% is equal to 1/100 or 0.01. How do you solve percent problems using a proportion ? 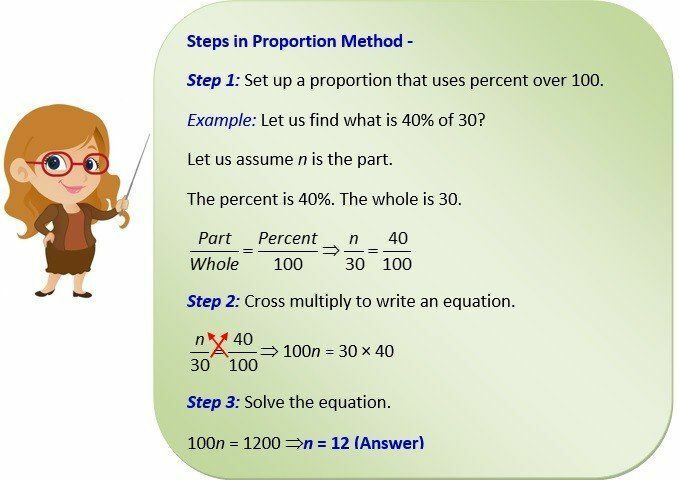 The proportion method works for all three types of percent problems. What is 40% of 30? 25% of what number is 75? 5 is what percent of 4? 1. What is 80% of 15? Let n represent the part. Write a proportion to solve for n.
What is 250% of 70? What is 67% of 105? The art club had an election to select a president. 60% of the 200 members of the club voted in the election. How many members voted? Kelly’s Burgers cooks its burgers either well done or medium. The restaurant served 20 burgers last night, 85% of which were well done. How many well-done burgers did the restaurant serve? Ben brought chocolate and vanilla cupcakes to school for his birthday. 70 students decided to take a cupcake, and 90% of them picked vanilla. How many people picked a vanilla cupcake?